“Mobile first” is a slogan often used to stress the importance of having a solid mobile strategy for today’s business, in order to be prepared for tomorrow’s competitive environment. But saying “Mobile first”, goes beyond the mere consideration of a mobile approach in the overall planning of a business, it makes it a priority in the management agenda. As Eric Schmidt has remembered at the Mobile World Congress earlier this week, “mobile first” is a prerogative for Google, since all the products that are rolled out have to be optimized for mobile usage (i.e. “mobile ready“). Even if this is a first step, a mobile strategy goes far beyond simple device compatibility and UI optimization. Thinking mobile is probably the best way to understand tomorrow’s user behavior, and therefore adapt your business strategy to the ever-changing competitive environment in which it operates. I believe there is not just one angle to look at the “mobile first” philosophy, but there are many different aspects that should be taken in to consideration. 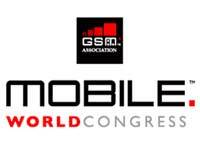 Thanks to my exhibitor-pass, I was able to participate to the Mobile World Congress in Barcelona, and spot some very interesting trends that are going to define the way we are going to do business in the future (online and offline). The Mobile Revolution is happening NOW – In February 2010 Morgan Stanley Research forecasted that smartphone sales would have surpassed pc sales by 2013. This happened last week! You may be already late! But don’t despair: as Jason Spero said, “It’s not too late to be early”! 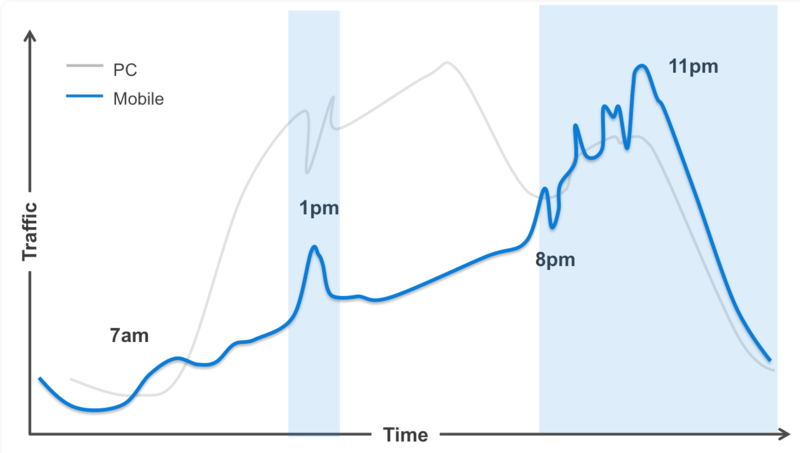 The mobile and desktop internet traffic will be complementary (see image), as well as the mobile usage behavior during the day or the week (mobile traffic is higher on weekends than on weekdays). This has a very strong implication in terms of online advertising, since it means that even if a good share of my users will be connected both from pc and from a mobile device, their purchase intention and receptivity towards an advertising message, will be much different, according to what they are doing at the time they are reached from the ad. For example, I may be much more interested in an FX Investment platform in the evening, when I read an article about the € – $ exchange rate increase, rather than when I’m at the office, where might just be concerned about the cash flow for the next month. More connected devices means more time spent online – Using more devices that are connected to the internet (to do things that go from checking in on Foursquare to check your flight status on Tripit), implies spending more time online. This means that the advertising space is multiplying, and businesses are going to have much more touch-points available to reach their customers and deliver their message. If we want to make a parallelism with the traditional advertising environment, we can say that when a new freeway is built, there are a lot more billboards we can place around it! Mobile devices are going to be your only devices – Mobile devices are now as powerful as most PCs, to the point that you are going to be able to replace your PC with a smartphone (or at least your laptop, as Motorola is trying to do with the Atrix). 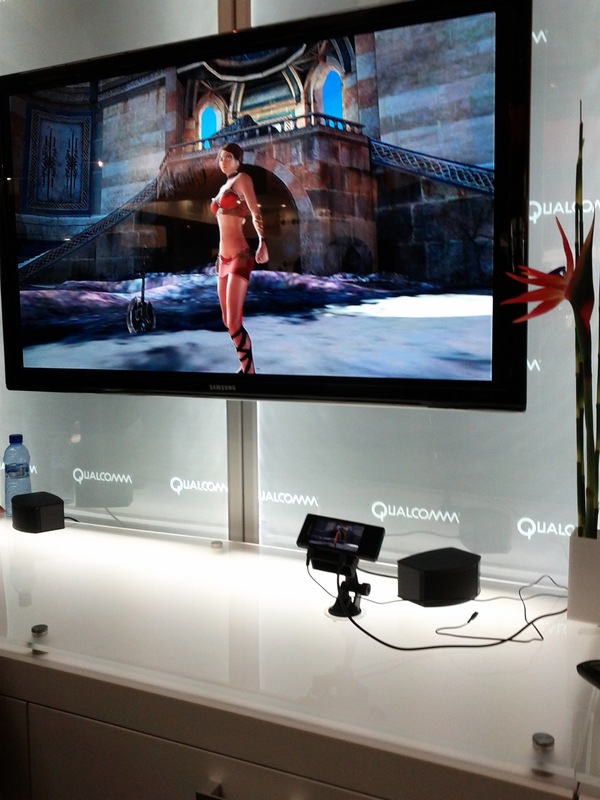 After spending half an our at the Qualcomm stand at the MWC, I was impressed by the mind blowing capabilities of the Snapdragon Processor, such as HD videogame play, wi-fi video-camera live streaming, and 3D HD-video playback (see pictures below, where everything was streamed to the HD TV from an HDMI port on the smarphones). I may need a keyboard and a larger screen, but who needs a pc anymore?! Mobile devices have unique features and capabilities that are soon going to be essential – The advantages brought forward by this new generation of mobile devices, are also given by their enhanced features, such as portability (a.k.a. 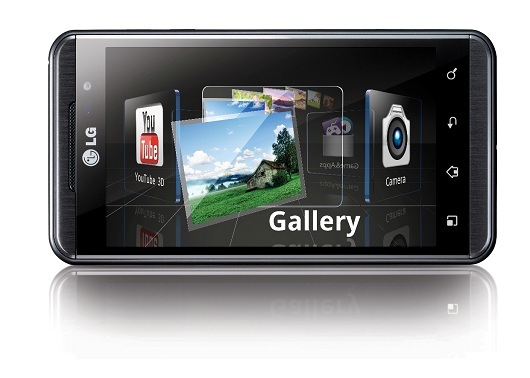 ubiquity), GPS location tracking, integrated cameras, glass-free 3D screen (and 3D video-recording capabilities like the LG Optimus 3D), touch screen, and many others. As a matter of fact at the MWC I met Thomas Williamson (CEO of War Drum Studios), and he showed me their Honeycomb-compatible version of History Channel Presents: Great Battles – Medieval (definitely not made for casual gamers). I was a little skeptic about the fact that someone would have bought a game like that for their tablet, rather than for their PC. I challenged him asking why in his opinion my money would have been best spent on their version of the game, rather than on the classic desktop version. He gave me a really good answer that was somehow eye-opening and really explained the whole idea beyond this “mobile revolution“. He said something like “Because it’s much batter lead an army with your hands rather than with a mouse!”. Now I get it, and I believe the capabilities of the portable devices are going to be a “game-changer” not only for the videogame industry, but for many other industries as well! Smartphones are going to be our wallets, so you’ll better integrate your payment systems! – At the MWC I’ve seen many companies that have developed technologies that would allow you to do a series of cash-related operations through NFC communication (that range from withdrawing cash from an ATM machine to do a purchase in a shop). Even if we still have the open issue of who is going to take care of the operations in the background (the banking institutions that issued your credit card, or the phone company that is going to bill you for all your calls and transactions at the end of the month? ), we are certain that merchants are in the need to integrate their payment systems, in order to allow for something that soon is going to become a need. Here we could even discuss about the platforms available at the moment and their business implications (complete but very different solutions such as the Apple Store and Amazon, ore more flexible platforms such as PayPal or Google Checkout), bet I’m going to leave this topic for another post. Mobile advertising platforms still offer SMS advertising as a core element in their portfolio: not for long! – I personally don’t believe much in this choice, since with smartphones that sync your email constantly, there is no more difference between an SMS and an email. The only distinction is that while with an email you can set filters or decide not to sync your inbox, with an SMS you always receive it. But what seems like an advantage can soon become a problem. One thing I’ve learned working in the online advertising industry, is that when you target a user with an ad at the wrong moment, it becomes “spammy”, and it makes more damage to your brand than benefit; with SMS advertising you have the reassurance of gaining a very little piece of the consumer attention almost all the time, but if it happens to be the wrong time, it may just be hurtful. I’m not a big expert in SMS advertising, so I’ll leave this point open for discussion in the comments for whoever has more knowledge/experience. 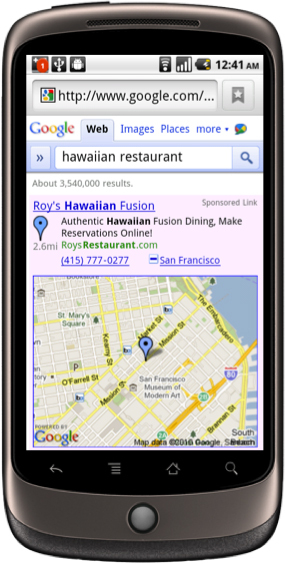 Local targeting and situational marketing is going to be the epicenter of the “mobile revolution” in online advertising – Is not just about where you are, but as Eric Schmidt puts it, “your phone knows what you are doing, and, with your permission, can use that information to deliver you more targeted results” . As I was saying before, is not just what you like, but the moment when your purchase intent is at max: seeing a flyer with a 20% discount on a sushi restaurant in the morning when I’m going to the office, is not going to be not as appealing as when I’m going to see an ad on my cellphone right after a search for “japanese restaurants” (and my phone knows where I am and which restaurant is closer to me). Even better if I can reserve a table with just one click. Same efficacy issue exists when I see a banner ad while looking for recipe to make sushi myself. Fragmentation is still an issue, and probably will be in the future, dont’t pick sides! – Android’s open philosophy has been far less successful in preventing fragmentation that Apple’s closed-approach. I won’t point fingers here, because while on a side I believe that fragmentation is a pain, on the other openness favors technological development and the user in general; moreover openness favors also freedom, and I feel always a little sorry when I think about my friends on an iPhone that miss on a lot of good flash-based sites. In any case the point here is that given that fragmentation is (and will be) a problem, when you are going to have to make a choice between developing an app and a mobile-optimized website, try to go for the website: is cheaper, accessible from everyone, doesn’t have firmware or hardware limitation, and is upgraded to all the OSs simultaneously. It would be silly to pick sides in this times, when the mobile industry is so fervent and so volatile: either you have an app for every OS or you just develop in html/html5. A mobile site is not just a smaller version of a your traditional website – Be careful not to replicate the content of your desktop site on your mobile site. In relation to what I was seeing in the previous two paragraphs, different situations bring forward different needs. This is why websites like eBay or Amazon strip down many features from their mobile websites, and focus on the things that you my need most. And don’t even get me started on mobile-website usability! Best converting websites have often very simple designs. Nowadays the true professionals in web-design, approach the development of regular websites starting from the same space-efficient design and need-based construction they would apply to a mobile site. The user engagement with your website, is not given by the number of links and features you present him in any given page, but his ability to find exactly what he needs in your website. The future is multi screen (or multi-device), content needs to be accessible from every device – This is why cloud computing is so cool, why Microsoft is going to rock with it Office version optimized for Windows Phone 7, why RIM is going to make many people happy with the optimized version of SAP installed on its PlayBook, and why i believe in many brilliant little extensions like Chrome to Phone, are really looking out for our needs. We are continuously on the move, this doesn’t mean we want to compromise on the accessibility of our content (see also next point). Internet is everywhere, make content available everywhere – Last year I had a client that was sitting on a goldmine, but just didn’t get himself to mine it: this company has been a publishing high quality content for many years, and had an awful amount of gudes, tutorials, courses, etc. on very interesting topics (such as digital photography or video-recording). The first thing I suggested them was to do digitalize them, split them in sections, and sell them virtually online, individually or in batch. They “weren’t sure about it”, they procrastinated, and flushed a lot of money online trying to sell the paper version that had to be delivered at your house via post. If I’m on the go with my DSLR and I want to use a special techniques that I saw once on the tutorial, is it more probabile that just pop out my phone and check how to do it online, or that I go home and look in the paper-guide I bought?! Exactly! 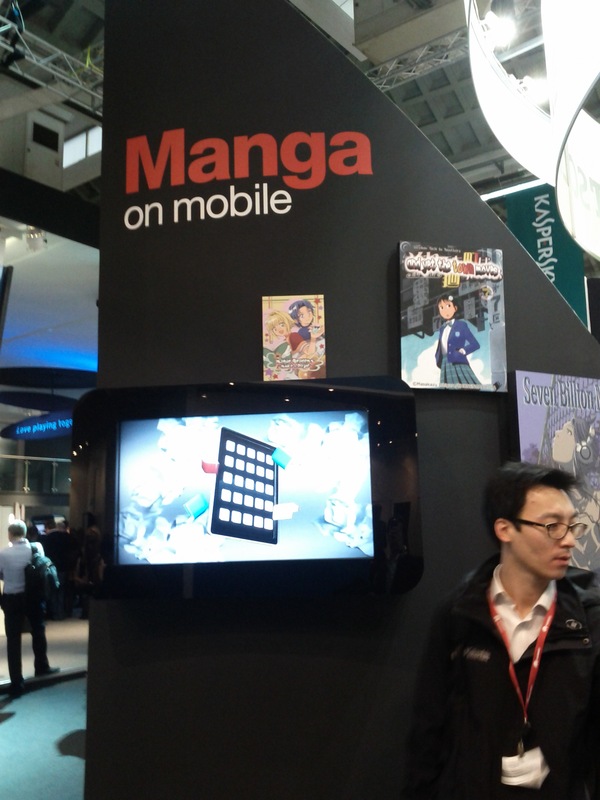 This is basically what the guys from Manga on Mobile (picture) thought as well: I’m sure they are going to be far more successful that my former client. Breakthrough apps are designed for the end user, not for monetization – Make money out of an app is just the desirable outcome, but if people don’t grow an addiction to your app, you are never going to make millions out of it! I’ve just limited experience with mobile apps (on the business side), but if we look at what Rovio Mobile was able to achieve, I don’t have problems in believing it! Is still not clear what is the best monetization strategy for an app or game – By following some businesses that are rolling out apps, talking to several expositors at the MWC and reading many articles online, is clear that the best monetization strategy for a game or an app hasn’t been found yet. I personally believe there is not a unique formula to it, but this does nothing but reinforce the previous pont, which is “make money out your app is the desirable outcome, but shouldn’t be the main focus in the development phase“. In app purchase will be a fundamental feature in the future – Especially when the we have monetization models based on “free-download & paid add-ons”. Not many platforms support this feature right now, but all the big companies in the sector are moving towards that direction, and this is going to create big opportunities for developers. Development should be device agnostic between tablets and smartphones. 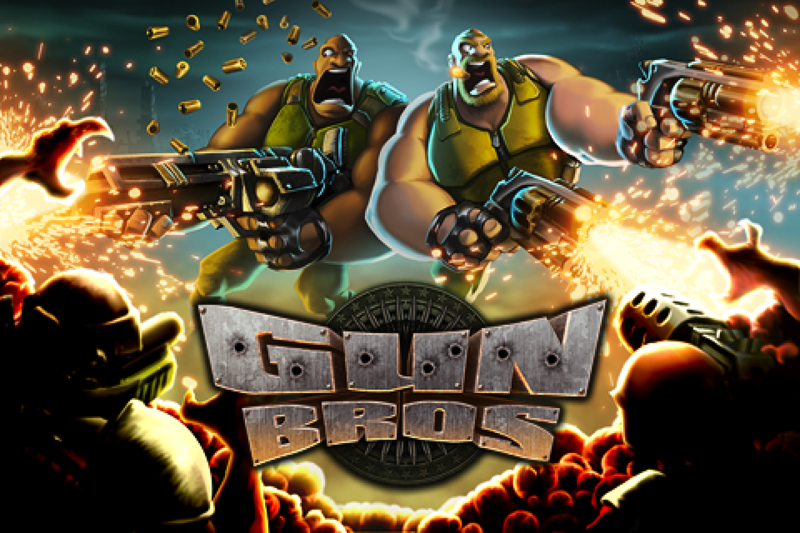 I love the fact that I can play Guns Bros from Glu Mobile Inc. both on my Nexus S and on a Xoom tablet. 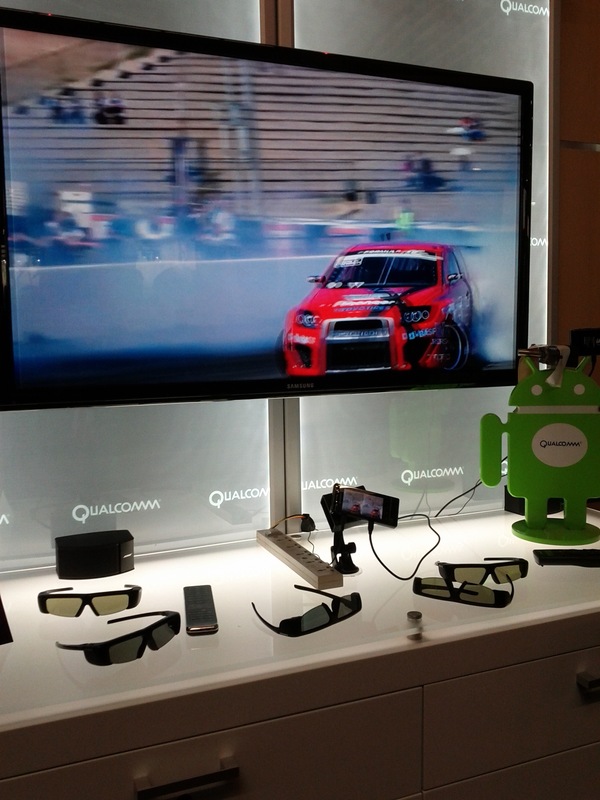 Fragmentation should not be a stopper, especially if the future is multi-screen! Portable devices are not just for fun, but will also improve dramatically our standards of living and our safety. A lot of expositors at the MWC were already presenting solutions for the healthcare sector. I feel reassured by the fact that one day my phone, in case something happens to me, will be able to automatically call the emergency, give away my position to the ambulance, make available my clinical records and health status of the past few days to the crew on site. Business should think “what does it mean to have consumers always connected?“. If I were selling security systems, how competitive would be my offer if I hadn’t live-camera streaming available to remote mobile devices? These are just a few of the trends that are going to shape the business environment in the future. I don’t think to be the the only one to have spot them, I just believe that there a lot of opportunities to be seized yet, and too much hesitation around them. After all the first mover advantage is alway going to be a key strategic asset! • If an employee can use their personal phone as their work computer… then how does the company enforce an appropriate level of security on that person’s device, especially when they leave the office? • Users carrying their phones everywhere and constantly accessing new data networks presents a huge security risk (one that’s already present today, of course). How will our web technologies evolve to protect us, behind the scenes, without hindering their ease of use? – Walk into a McDonald’s, set your phone on the table, and while you’re eating you can stream your favorite TV show onto a TV installed in the booth? – Multiple people can connect, simultaneously, to a single large display, and share files back and forth with each other? – Your device can link into your car, send music/content/etc to the car and receive detailed readings back from the vehicle… sending that data somewhere if necessary (imagine Google Maps (w/ Traffic overlay) that can *actually* sense the location of vehicles on the road in real-time, no inaccuracies). It’s going to be nuts! Also, in regards to advertising… I think that the next big revolution in advertising is, as you mentioned, reaching people at the appropriate moment. Even though we are all very numb to advertising messages, there will always be a right time and right place for a message to strike a chord with us. Somehow, they must find a way to reach me at “that moment”, the point at which I am in the correct emotional and mental state so as to be receptive toward an advertising message. It’s not about profiling me as an individual, although that’s a decent start. It’s about hitting me at that precise point in space and time where I won’t view the advertising message as intrusive at all… but actually perceive it as a helpful piece of information. Mobile devices will help them detect that moment (through geolocation, etc.) although it will also come from information available on the web. Obviously, the implications of such a powerful and subtle advertising engine are creepy at best, sinister at worst. While it’s okay that a business targeted me and I made a purchase because it’s actually helpful and we both receive a benefit — it’s well established that marketers/advertisers are not the most ethical and sensitive sector. We cannot have advertisers taking advantage of people, for instance, at a very low or vulnerable point in their lives, which is something that will certainly be possible to detect as these technologies evolve. Security is always an issue when we increase accessibility of what we consider valuable to us, although I believe cellphones can guarantee the same level of security (if not higher) when used instead of a PC. The Motorola Atrix 4G for example, has a fingerprint reader on the device, which allows you to lock unlock your phone. I wouldn’t see any problem in implementing also a voice recognition system and -why not- maybe one day a retina-scan system; after all there are many smatphones that already mount a 5/8Mpx camera already. I believe that the true problem here would be keeping your personal file stored in a 3rd party server, rather than in your own facilities, and when connecting to reach those files, making yourself vulnerable to attacks. Maybe in the future we will not keep PC anymore in our houses, but just server-like storage devices always connected to the internet that would allow us own our piece of “the cloud”. After all I believe that the sensitive information that anyone has are no more than a few giga, and nowadays you can purchase a 2TB hard-disk at no more than 150$. We would still be vulnerable to attacks being connected to the net and accessing it, but the problem, as you said, already exists today. The social power of combining anonymous information are just beyond imagination. As the car-example you made exemplifies, combining data from multiple sources in real time allows you to having exact information rather than relying on estimations. Google Flu Trends http://www.google.org/flutrends/about/how.html is another great example of it. As far as online advertising is concerned, you totally got the point, and I believe that the industry is going to reach that level of intelligent “pre-emptive” advertising, is when we’ll get to the real web 3.0 revolution. I can setup rules to my advertising platform saying: when the temperature in LA rises above 77degrees, send live the advertising banner “Hot outside?! Get cool with our air conditioning system now at 20% discount!” (or something a little better possibly!). I believe semantic web will be the true revolution in targeted advertising. Obviously providers (and even legislators) need to draw a line between what information can be used to target advertising and what not, and assure that the user has full control over their own information. On one side it would be nice if my health-monitoring app would feed me anti-cholesterol drugs ads if my cholesterol becomes an issue, but at the same time I would like to be able to opt-out of this kind of targeted advertising, whenever I want. People often complaint that advertising that use their personal information is something bad and harmful to their privacy, but I believe that this is true only if you don’t have control over your personal information and the way they are used. In my opinion, since I’m going to get advertising anyway, I’d rather have it targeted to my needs rather than totally irrelevant. Internet – in many cases – gives you a wider control on this than traditional advertising: clear your cache and cookies, opt out of the mailing list, and you are not to be targeted anymore. 5 years ago I signed up to a gym in Milan and I keep getting their sms on my cellphone even if I haven’t lived there for almost 3 years; I’ve called and emailed them plenty of times, and even if they assured me I was deleted from their systems, some of their “partners” keep sending me their promotional messages – for me that is true spam and no control over my personal information! Next Next post: Planning an Online Advertising Campaign: if the Theory is so Simple, Why No One Executes Properly?